We at DISRUPT Media have put together the top 12 benefits of social media your death care company can take advantage of right now. Facebook is the best way to build your brand in today’s market. Facebook lets you advertise and have an open dialogue with consumers and generate meaningful content and relationships. If you don’t have a Facebook Paget for your funeral home or death care business, you’re already behind. Bring attention to your business by establishing your brand on Facebook. This is the new word of mouth. Brand loyalty is about knowing more about your consumer than your competition does. Creating valuable content that consumers can engage with leads to a deeper relationship with clients; the more you know about someone, the more complex the relationship becomes. Focusing on creating organic content and humanizing your brand allows funeral companies to better educate the consumer and establish a deeper relationship. Consumers connect with people and connect with a story. Use your Facebook Page to get personal with your audience. Showcase your staff members so consumers can get to know your funeral home. Transparency is so important in this field; transparency is what will attract consumers to your brand. The amazing thing about the internet is that there is no hierarchy. Users can do whatever they want with the knowledge they acquire. Producing content that is entertaining and engaging will set you apart from your competitors. Funeral homes can position themselves as a leader in the community by putting out more content than any other competitor. This establishes them as an authority and a thought leader. Keep in mind that consumers can see right through BS, so be real and be transparent. Targeted advertising allows brands to target a specific demographic with ads. Funeral homes can choose who their ads target based on age, race, gender, income, and interests. This is such a valuable tool; once you go through that checklist, Facebook will only show that ad to the specific person you are trying to reach and, therefore, saves money. A smaller pool of people are targeted, so you’d be spending less money and reaching a more specific group of consumers. For example, at DISRUPT Media, we ran an ad for a funeral home in South Carolina that carried a Gamecocks casket. It was shared many times, and people were tagging family members in the comments to tell them that this was the casket they wanted for their funeral. One man, in particular, loved it but had already made pre-need arrangements at another funeral home. The funeral home was able to message that user privately and switched his pre-need to their funeral home. This targeted advertisement, towards older males, brought in business for this funeral home. Retargeting is the type of advertising that makes you think “Man, how did they know that? !” If you were just online shopping for a new computer and you get on Facebook and see that same computer in an ad, you have been retargeted. Freaky, but it works. If that product you were considering buying keeps showing up, you are more inclined to buy it. Facebook allows every ad account to do this. At DISRUPT, we tried this with a few funeral homes by using cookies to track the consumers that visited the obituaries section of their website for 90 days. This gives the business valuable information about the consumer that can be used to better target them when creating new ads. Brand loyalty and transparency are what improve sales. Shopping and buying habits consumers have don’t change when it comes to funeral services. The way consumers look for reviews, referrals, and testimonials from friends and families are the same. So, to improve sales is to improve the quality of the content. If a consumer is engaging with the same funeral home every day or every week, why would they call a different funeral home when they are ready to pre-plan or are in an at-need situation? 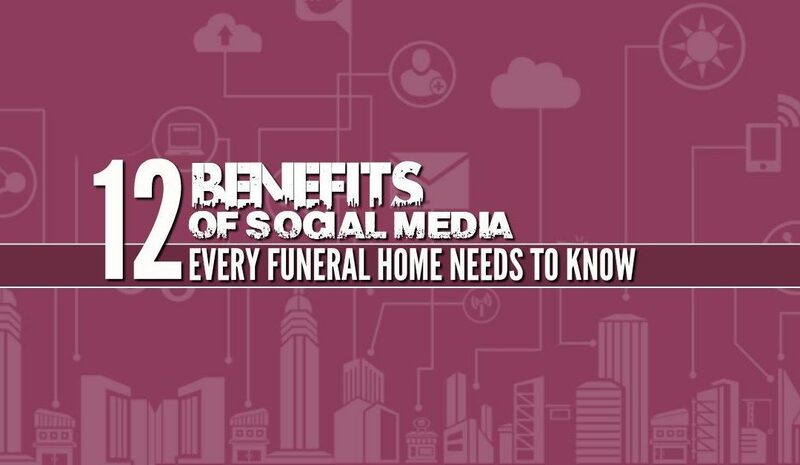 According to the NFDA 2017 Consumer Awareness and Preferences Study, “Only 18.9% respondents contacted more than one funeral home in their time of need.” If they are already connecting with your brand, they aren’t going to go somewhere else when it comes to their at-need or pre-need service. Conversions come after a period of engaging with the consumer and building the relationship. Create better content that is more internal, more engaging, and more transparent. Once the relationship is there, it can be converted to a preneed lead or your top of mind in an at-need situation. The turn-over rate will be a lot higher because of the relationship that was established through social media content. Encourage consumers to ‘like,' share, and comment on your posts to get your name out there. Consumers are interested in what their friends are interested in. If they see a friend engaged with a video that was posted on your Facebook page, they will watch the video and check out more posts. This would even lead to them liking your page so they can see what you post in the future. Growing your audience will increase your website traffic, and increase at-need and pre-need calls. We all know that the funeral profession is a relationship business. The best way to establish a base of consumers is by creating relationships within your community. Go to local events and post about it on your Facebook page. Share pictures of your staff with members of the community. This puts your name out there and shows that you are involved. 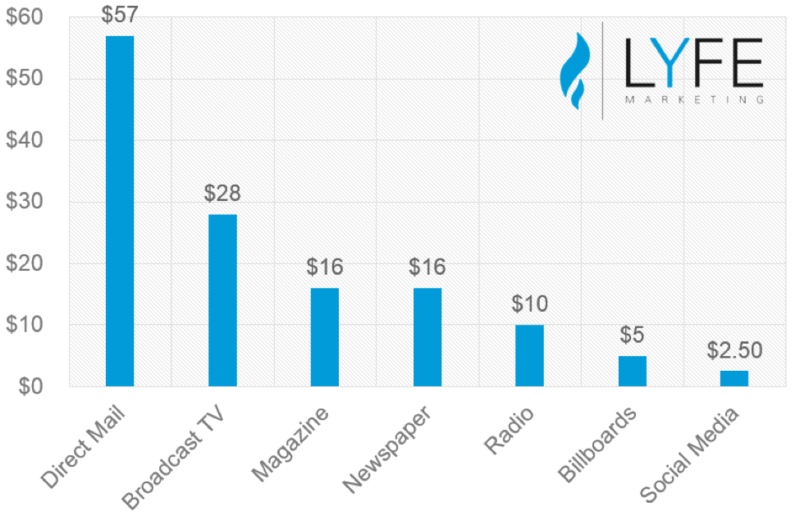 This graphic from LYFE Marketing that shows how much money you save by marketing on Facebook rather than traditional forms of advertisement. They calculated the CPM for seven different advertising mediums to show how much money you would have to spend to reach 1,000 consumers. This study shows that it only costs $2.50 to reach 1,000 consumers on Facebook. This statistic should cause businesses to reconsider their marketing strategy; this has the potential to allocate their funds to different categories in their budget, resulting in businesses being able to spend more time focusing on the consumer and their needs. Facebook is the best place to reach your target audience. Women over 45 are the ones that are looking into funeral homes; they’re your biggest audience. Women in that demographic can’t get enough of Facebook. Cater to them by investing the time and the small amount of money it takes to reach your audience because it will absolutely pay for itself in the long run. Social media is the cheapest, easiest and most effective way of marketing today. Invest in the commitment to more successful marketing. Written by Madison Ashby in the perspective of Ryan Thogmartin.